In today’s episode we talk about Captain Owen’s third birthday party! He got a ton of fun goodies including more Star Wars Galactic Heroes, Rainbow Dash and Applejack, The World of Eric Carle My First Smart Pad Library, Melissa & Doug See & Spell, and so much more that I’m sure we’ll be hearing about in future episodes. We talk a little bit about the Star Wars game on my phone, and I have to admit I’ve been playing a lot of Star Wars: Galaxy of Heroes on my phone lately. While I will occasionally let Owen help me with a battle or two, I try to keep my games out of sight and out of his hands. So I shouldn’t have been surprised when he started playing “my game” with his Galactic Heroes figures. He sets up two teams of guys and has them battle it out just like in the iOS game. Everyday I’m amazed to watch those gears of his turning. Today we talk about some of Captain Owen’s Star Wars toys including a Darth Vader/Ahsoka two-pack we grabbed at Disneyland and a bunch of his Galactic Heroes figures. We then do a sort of re-telling of the Tatooine portion of Return of the Jedi. We talk a little bit about the RunDisney Kid’s Races from both this year and last. And then we finish up talking a little bit about these awesome 3D printable dungeon pieces called DragonLock from Fat Dragon Games. Another Disneyland trip under our belts. We traveled to Anaheim for the second annual runDisney Star Wars race weekend. We spent the Friday before our races in both Disney parks, and this episode contains two segments. First we chat for a few minutes about what rides we are going to go on before getting ready to head to the park (three of Owen’s favorite rides–Autopia, the railroad, and Jungle Cruise all ended up being closed for the day), and then the morning after we talk about what we did at the parks before heading to Owen’s Kids’ Race. Happy Anniversary! Well, almost. We have a new intro and a new graphic to celebrate the new year and our one-year anniversary. In this episode Captain Owen tells us a magic Star Wars story, and we are joined by his Uncle Forest and Grandpa Rob. Sorry it’s a little short but we’ve been quite busy with the holidays. But our next episode will be jam packed with our adventures at Disneyland and running the Star Wars races for the second year in a row. After braving the Star Wars marathon on Thursday, we took Captain Owen to see The Force Awakens on Friday morning. WARNING: This episode contains major spoilers for The Force Awakens. DO NOT listen yet if you haven’t seen the movie and do not want to hear spoilers. 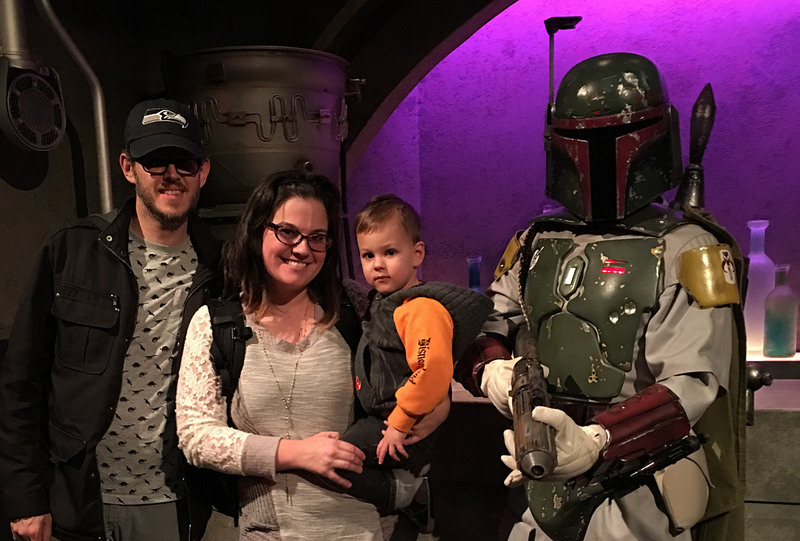 However, if you do want to hear about a two-year-old discussing seeing his first ever Star Wars movie in a theater, please listen! In today’s episode we read through Captain Owen’s newest favorite book–Star Wars:A Pop-up Guide to the Galaxy. Captain Owen does several of his Star Wars impressions, and we learn who his current favorite character is. Also, the character whose name I blanked on was Salacious Crumb. You can also read my full review on GeekDad.com of the book for more details and pictures.